We didn’t wait for a long time in the Sultanate of Brunei until we have met the Sultan Hassanal Bolkiah who - as we expected - was calm, smiley and a good listener, and despite the time constraints because of preoccupation of His Majesty; we benefited a lot of his guidance and advices regarding humanitarian acts, and it surprised us more to not face any protocol complexity at the court of the Sultanate, as once we entered the Sultan's Palace " Astana" everyone was smiley and friendly, specially that we did not mention politics, current events or what is happening here and there, as well as we did not talk about misfortunes and calamities that afflict some nations. His Majesty talked briefly on humanitarian acts and the steps taken by Brunei to strengthen its economy and diversify sources of income... The Sultan talked as a father, skilled expert and a mentor advising; we were listening and benefiting of that opportunity so we can know more, understand deeper and analyze more properly. The time allocated for this interview was twenty minutes and it’s not a little time according to kings and sultans, we felt that we went out with a useful and sensitive guidance especially with regard to humanitarian acts in those areas. Perhaps the biggest advantage we have made is really the privilege of meeting His Majesty on the land of peace, love and safety...Brunei Darussalam. When the Yemeni non-violent revolution started and the citizens protested demanding reforms at first and then the overthrow of the regime; there was two groups; the first represents the people or most of them and the second represents the regime and its symbols, just like all ancient, modern and the coming revolutions, however, we were surprised by dissents which appear very strange at first glance, and many of analysts who are familiar with Yemeni affairs believe that they are suspicious dissents that aims at distracting people's revolution. In other words; whether these dissents are real, fabricated, or the result of events based on the principle of "Save yourself before you are taken by the flood," they put obstacles in front of the revolution and divert its peaceful path to non-peaceful which is what happened when Sheikh Sadiq Al-Ahmar declares to join the rebels, as well as Ali Mohsen the commander of first brigade. I - and all observers - do not know the secret behind this dissent among the members of the ruling family, was "Ali Mohsen Al-Ahmar" deprived from his rights and locked at home before the popular movement so he announced his dissent? Or does he expect to receive the reins of power so presidency won’t be out of the Al-Ahmar’s family? If Sheikh Sadiq actually supports the demands of the people when he joins them then why does he resort to arms in a way that is more like a drama than a fact where the authority is incapable of winning against him and he is also incapable of winning, they distracted the people and protesters with their stories and disputes which being showed as if the first part is defending the legitimacy and the other part is defending the revolution, while both parties are maneuvering and shedding Yemeni blood without any relation for both parties to the people’s movement. The Yemeni president was at the brink of death, and then returned after months of therapy to use the same method in response to the Gulf initiative trying to gain more time, but this time using the arms and throwing out all his obligations to leave the authority. 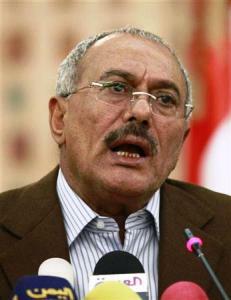 There is no doubt at all that the regime, led by President Ali Abdullah Saleh, is trying to play intelligently and wisely which was misplaced as he is holding a number of cards and showing them one after the other according to time and place, and what characterizes the topic of Yemen from others is the injuries happened to the president in an attempt to assassinate him, which is apparently an attempt by the closest people to him to end the popular movement and the revolution by the death of President only and keeping the regime, and most likely that is exactly what the tribe or family and those who are so close to leaders of the regime want, trying to do so to save the regime by the death of the President which is a precedent never happened before in any country, and if it succeeded they would’ve received a patent, however, the fate is God's will not humans. Personally, by knowing the President of Yemen when I met him in Sanaa and Aden many years ago, and according to what we hear and read about him previously; we expected him not to return to Yemen from the treatment trip in Saudi Arabia and we expected that he will accept & announce ceding authority as thanks to Allah Almighty who protected him from death and showed him the reality, as the person who tried to kill him along with the people with him must be among his closest & trusted retinue, otherwise he could not have been able to plant the bomb in the mosque. The poor people who are protesting & sleeping on the ground have no hand in the attempt of assassination, but now they are lost and watching the events as if they are not a part of it. The problem now is heading toward to form a struggle on power between the president and Ali Mohsen, which means between one family from one tribe, and people only have to wait for results, or at least that is how the president wanted for it to appear, and so Ali Mohsen al-Ahmar carried out what the President wanted, and Sheikh Sadeq joined to form "Al-Ahmar (Red) Trinity" in Yemen, however the only thing which is really red in the whole matter is the color of the Yemeni blood which has been shed - and still - on the land of Yemen .